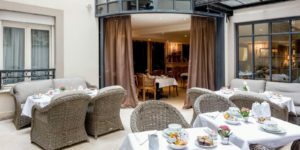 What a pleasure to read such an enthralling report of a recent Grape Escapes trip… we’re delighted to hear how fabulous this surprise anniversary Paris tour was! “Paris holds many memories for me…… 21 and a bit years ago, my husband surprised me with a trip there and proposed to me. We had very little money and stayed in a hotel which was just about passable in a very undesirable part of Paris, within walking distance of the Gare du Nord. Fast forward to 2017 and the approach of our 20th wedding anniversary. It made perfect sense to go back to Paris, where it all began, so we asked the Grape Escapes team to organise it and to make it a lot more salubrious than our engagement trip. And what an amazing job they did. Everything was kept as a secret so all I knew was that we were going to Paris on the Eurostar. On the allotted morning, we got up and had breakfast, then headed off to the station. 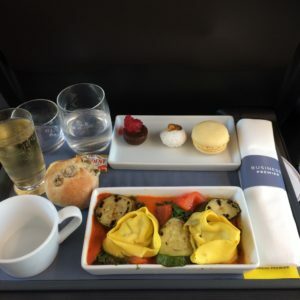 When we arrived at the Eurostar, surprise number one – entrance to the business lounge with free breakfast. 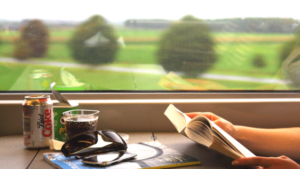 We spent a relaxed half hour in the air-conditioned lounge, eating delicious French pastries, croissants and drinking coffee, whilst reading the complimentary papers. We had standard premier tickets and this gave us more comfortable seating and more space. And breakfast!! Obviously, it would have been rude to refuse, so I gamely ate a few more croissants. Upon arrival at Gare du Nord in Paris, we were greeted by Christophe, our chauffeur. As he drove us through the streets of Paris, we were given a guided tour (which could have been in a number of languages but we opted for the traditional French). We arrived at Hotel Chateaubriand, a lovely little 4* hotel, in a side street just off the Champs Elysees. This hotel has 28 rooms and feels very much like staying in someone’s home. There is an internal patio area which allows you to sit in the fresh air away from road noise, and a gold wall which is painted withoriental birds, butterflies and flora. The owner collects art and antiques from all over the world – I loved the mix of styles but it may not be to everyone’s taste. One of the most fascinating aspects of this hotel is the ‘trésors caches’- surprise miniature pictures in each room- often found hiding behind curtains or in unusual places. Each room was individually decorated and included pieces of art and antiques which matched the style of the room. As this is such a small hotel, there is no restaurant on site but they have an external caterer who will provide room service should you wish to eat in the hotel. However, there are so many restaurants within a stones throw of the hotel, that this should not be a problem. In a street nearby, there was even France’s answer to the smoking ban – a restaurant which provided “bongs” filled with your choice of vapes so you could vape between courses. A truly bizarre sight to see all the tables with bongs and smell the mix of different flavour vapes as you walk past. We then took a leisurely stroll to the Champs Elysees, where we sat and had a drink in one of the many pavement cafes. After returning to our hotel to freshen up, we got dressed for dinner and set off. I wasn’t allowed to know where we were going for dinner but as we walked in the general direction, I began to realise whereit was – the venue is somewhat tricky to hide, given that it is the most iconic emblem of Paris! Our dinner had been pre-booked in the Eiffel Tower’s restaurant 58, so we went to a separate entrance bypassing the queues and then up in the lift to the first floor. There were various different menus available – the more you paid, the closer to the window you were. There was a good choice of dishes for each course on the set menu, and wine and champagne were included. The food was well cooked and beautifully presented. After dinner, we decided to walk to the top of the Eiffel tower – over 300 steps later and only one more layer up, we thought perhaps this was not such a good plan and bought tickets to use the lifts. Despite the fact that it was raining and there was lightning by the time we reached the top, it was definitely worth doing – the views were amazing. Eventually, we left the Eiffel tower and wandered back to the hotel (or in my case, hobbled, as the shoes I was wearing were not so comfortable by then!). The second morning of our stay dawned bright and sunny. 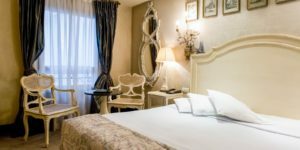 Having eaten a delicious continental breakfast at the hotel, we checked out and walked the short distance to our second hotel, the 5* Napoleon which is one road away from the Champs Elysees. 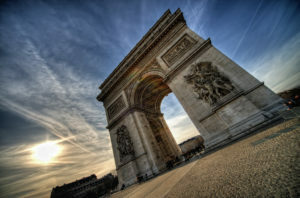 This hotel is very close to L’Arc de Triomphe, and many of the rooms had views of it. The atmosphere in the hotel is opulent, calm and sophisticated – it is impeccably decorated and furnished. We were shown to a suite with a private terrace overlooking the Arc de Triomphe. The attention of the staff was outstanding from the moment we entered – nothing was too much bother. At one point, someone asked me what we were doing next and I replied that I didn’t know as it was a surprise for our wedding anniversary – when we arrived back in our room later in the day, a bottle of Champagne and a basket of fruit had been delivered!!! Having settled into the hotel, we were off again on a walk to another mystery destination. 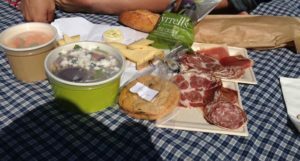 This time we went to the Trocedero gardens where there was a sumptuous picnic waiting for us; baguette, bottle of wine, cured meats, salad, fruit, crisps and chocolate brownie, all beautifully packaged and deliciously fresh. We spent a relaxing hour lying on the grass munching our picnic. After lunch, we jumped into a taxi and went to a Champagne bar in the Latin quarter where we tried 3 different Champagnes. After stopping at a café overlooking Notre Dame, we decided to walk back towards the hotel via the famous jewellery square at Place Vendome. There were some stunning pieces in the windows but those that had prices, had rather more zeroes at the end than I would be prepared to pay, so I came away empty handed! As we were running short on time, we jumped on the metro back to the hotel where we freshened up before grabbing a quick dinner in the hotel restaurant. Then we walked the short distance to the “Lido” for a cabaret show. This was truly phenomenal in terms of the choreography and execution; every dancer was exactly positioned and moved in harmony to make the overall effect mesmerising. The costumes were stunning, although they seem to have run out of material before making the tops in many instances! As well as dancers, there was a brilliant mine artist who appeared throughout the show, a sword swallower, and a pair of acrobats who performed all manner of feats hanging from a rope. The whole show was excellent and I would highly recommend this show for its pure theatrical exuberance. 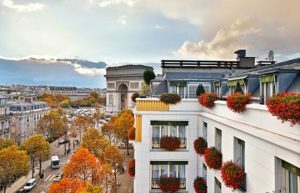 When we arrived back at the hotel, we sat on our private terrace, looking at L’Arc de Triomphe, eating the fruit and drinking the Champagne which the hotel had kindly given us. On the third morning, we went down to breakfast and were greeted by name by the staff; the breakfast was first class and the staff very attentive. Our final activity of the trip was a cruise along the Seine which was very informative. It went from just by the Eiffel Tower all the way to Notre Dame and we were given information about all of the buildings on each side. 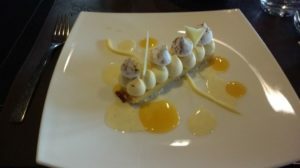 Having disembarked, we then headed back towards the Latin quarter and found a restaurant off the beaten track where we ate snails, fois gras, and other traditional French food. After returning to the hotel to collect our luggage, we went back to Gare du Nord for our return Eurostar. This time, we had business premier tickets so not only had a super speedy check in, we had G&T’s and aperitifs in the lounge, then a full dinner with wine on the train back. 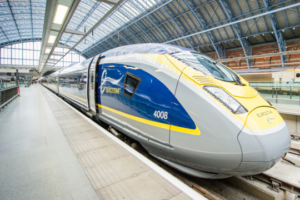 Inspired to head to Paris? 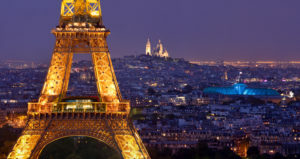 Check out our brand new Essential Paris and Champagne break!